In real life, the football season accelerates during the festive period. It’s no different in the virtual world, and it’s fitting that the next event on the Global Series calendar takes place in London, with the Premier League the busiest division in the world at this wonderful time of year. We have seen major tournaments occur over the past two weekends, both in Bucharest, to kick-start the EA Sports FIFA 19 Global Series, with all the competitors on the Road to the FIFA eWorld Cup. This year, the format of the competition has been completely changed, with a new ranking points system giving a more accurate reflection of a player’s ability over the competitive season. The Gfinity FUT Champions Cup December is the third tournament of the Global Series so far, following on from the FUT Champions Cup November and the PGL FIFA 19 Cup, which both took place in Bucharest. Despite 96 players competing across the tournaments, both trophies were lifted by one man. The 17-year-old Donovan ‘F2Tekkz’ Hunt, repeated his success from last season by claiming the first tournament of the year, but built on that success by doing the double in the Romanian capital. Winning both tournaments has given the Englishman 2,380 Global Series points and $62,000 of prize money, putting him firmly in the driving seat for FIFA eWorld Cup qualification at the end of the season. Competitive FIFA action got underway in Bucharest with the first FUT Champions Cup of the season. The November tournament is the first of six this season, with one running every month until April. Tekkz negotiated the swiss-format group stage, and cruised through the knockouts. Dylan ‘DullenMIKE’ Neuhausen, Kylem ‘Lyricz vs Luck’ Edwards and Marcus Gomes were all put to the sword, but a clash against Dani ‘Ajax Dani’ Hagebeuk, the 2018 eLigue 1 Champion, was always going to be the toughest. A 6-3 victory for Tekkz meant he faced PS4 Champ Joksan ‘Joksan’ Redona, but the American’s experience on Xbox One let him down. Tekkz romped to a 7-1 victory to show he wasn’t just a ‘one tournament wonder’ to match the title he claimed at the FUT Champions Cup in Barcelona last season. 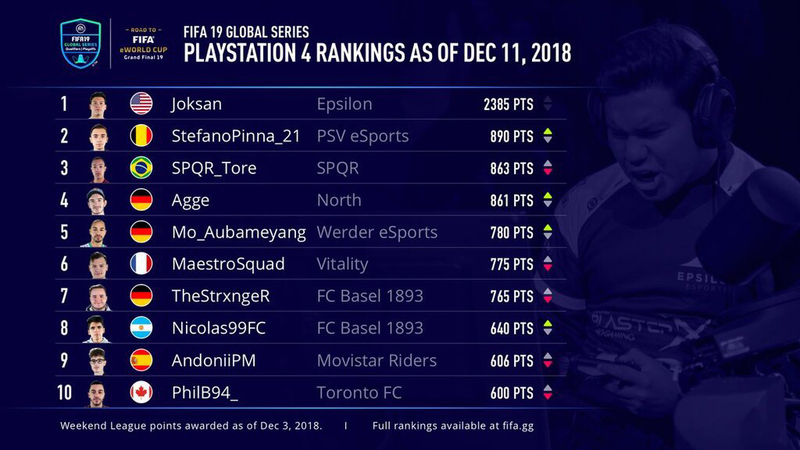 Joksan had a fantastic tournament himself, and he is the only player in the current standings who can match up to Tekkz, with the Epsilon man on 2,385 points in the PS4 leaderboard. That in fact puts him ahead of the Xbox One man in terms of total points, with PS4 players having one more tournament in the form of PlayStation Continental Cup back in October. Joksan picked off August ‘Agge’ Rosenmeier in the PS4 semi-finals before overcoming the Brazilian ‘SPQR TORE’ in the console final. 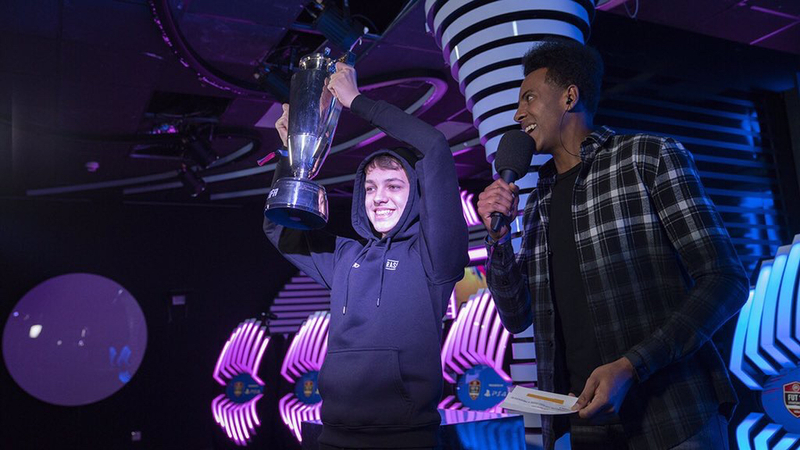 Back in Bucharest, all eyes were once again on F2Tekkz, but the teenager didn’t let that phase him, claiming the PGL FIFA 19 Cup to pick up back-to-back titles to start the FUT 19 competitive season. 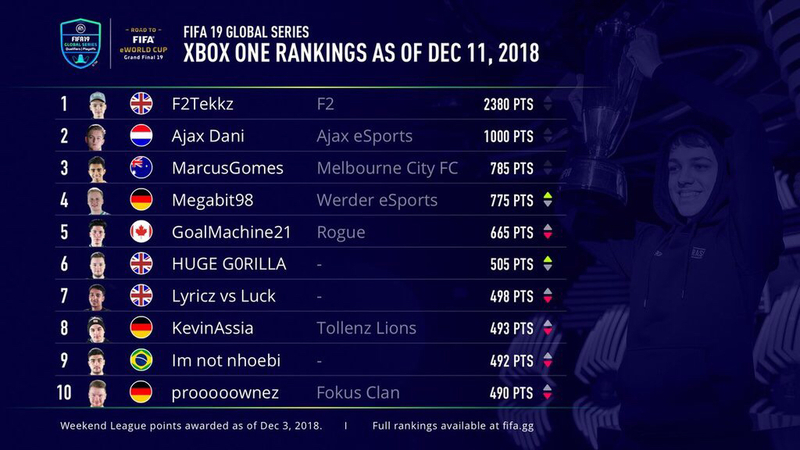 It was no easy path for Tekkz, who overcame the biggest name in FIFA esports, Spencer ‘Gorilla’ Ealing in the semi-finals. He then defeated FIFA 18 Global Series Xbox One Playoff Champion Michael ‘MegaBit’ Bittner in the Xbox One final, setting up a heavyweight clash with Stefano Pinna, the FIFA eWorld Cup runner-up and PlayStation 4 champion. Pinna had to negotiate some underdogs on his way to the final, in much the same way how he rose from obscurity last season. The Belgian defeated Faith ‘FIFAÜstun’ Üstun and then the undefeated ‘Keturdylo’, showing that last year was not a one off. F2Tekkz is unsurprisingly the favourite for the December Cup, but going three from three in major tournaments would to be a ridiculous achievement. MSDosary defeated StefanoPinna in the final of the eWorld Cup, but with the PSV esports man on-form so far this year, expect him to be firmly in the mix at the Gfinity Arena. Nicolas ‘nicolas99fc’ Villalba was one of the favourites last year at the eWorld Cup, and he is building nicely this season. One of the best defensive players in the world and with a console semi-final under his belt already this term, he should be feared. One of the most consistent performers in FIFA esports for some time, Mohammed ‘Mo_Aubameyang’ Harkous is a big fish in London. The German has won titles on FIFA 16, 17 and 18, but is yet to strike a major victory. That could all be about to change. Joksan must now be taken seriously after his glittering start to the season. If he has been putting in the practice on his unfamiliar Xbox console, he will be better prepared if he receives another final. A great character, MegaBit is one of many Germans hoping to make amends for their overall poor performance the Champions Cup in Bucharest. None of his compatriots reached the semi-final on either console, but MegaBit could be most likely to correct that after claiming the tournament in Paris last season. A man with experience of playing at the Gfinity Arena, Philipp ‘Eisvogel’ Schermer can call on his previous experience at the Gfinity Elite Series to pull out a strong performance for FUT Champions. In season three of the Elite Series, Eisvogel of Team Envy reached the semi-finals, with an incredibly unfortunate loss to AS Roma Fnatic costing his side a place in the final.